When I was a child, I heard of something called Crêpes Suzette. I didn’t know what it was, other than a dessert (which made it of obvious interest), but I imagined something sweet somehow involved with a woman named Suzette, who was surely dark-haired and very beautiful because she was foreign. Then one day I learned that crêpes were only thin pancakes - minus the maple syrup - and that Suzette was just the name of the very small girl present when they were served for the first time. AND that the whole thing was, in fact, an accident in which the liqueur-soaked crêpe sauce accidentally caught fire in the kitchen. So much for the exotic Suzette and her crêpes! All over France you’ll find crêpes at sidewalk stands. Their aroma and warmth are welcome in the cold grey drizzle of a Paris winter. It was always a treat for my children on the way home from school. Most French crêpes are served with just a smear of butter and a sprinkle of sugar, or with jam - usually strawberry or apricot - but sometimes with chocolate or hazelnut spread or crème de marron (a sweet chestnut spread). However, you can make a crêpe batter up to two hours in advance and then cook the crêpes when your guests arrive. Or you can cook a stack of them and keep them warm in the oven. Dress them up with your favorite topping, flame them with a liqueur, or add dollops of whipped or ice cream and a shower of sliced almonds. This recipe calls for rum but you can use anisette (anise flavoring), Cointreau or vanilla extract or any other liqueur or flavoring you like. Plus citrus zest to give it some zing. This is the traditional way of making crêpes. Julia Child just bungs everything in the mixer for 1 minute and strains any lumps out, but her batter has to be made 2 hours in advance (and left in the refrigerator). I’m posting this as February’s recipe because the 2nd is the Chandeleur (shahn-duh-luhr), the festival of the candles, which has been celebrated since the 7th century. The tradition is to hold a gold louis d’or coin in one hand and flip the crêpe with the other. (A silver dollar might work this side of the Atlantic.) This will make you a) rich or b) grant the wish you made as you flipped your crêpe. - Heat the milk to a boil. Take the milk off of the burner and add the [melted] butter. Leave it to cool. - Put the flour in a large bowl. Make a “well” in the center of the flour and break the eggs into the well, one by one. Whisk well. - Add a pinch of salt, then the water, then the flavoring (or zest). Slowly stir in the cooled milk. The batter should have no lumps, or else you need to strain them out. - Stir the batter before making each crêpe. - Pour a small “ladle-ful” of batter into a hot, well-greased crêpe or omelet pan, tilting the pan until just the bottom is thinly covered. Remember: these are not pancakes. The crêpe should look almost like lace. - When the edges start to brown, run a spatula knife under the crêpe, from the sides in, to make sure it doesn’t stick. - Toss the crêpe to flip it and let it finish browning. Don’t cook the crêpes too much; they should be golden, like the sun that they may once have represented at this half-way point of winter. And don’t worry if your crêpe sticks to the ceiling or the cupboards when you flip it. At least the first one. In the old days, the French said that if it was still stuck there in the autumn, you’d have a good harvest. I’ve lived in Montmartre long enough to see it shed several of its skins. When I moved here in 1970, it was a mixed bag of blue collar workers who raised three kids in one- or occasionally two-bedroom apartments, and of artisans - plumbers, electricians, carpenters - and shopkeepers - the butcher, the baker, the grocer, the fish monger - plus just the right scattering of artists, actors and entertainers to keep things interesting. Everyone talked to everyone else as they went about their daily lives, which were somewhat overlapping and intertwined. After about fifteen years, there was a gradual spillover from the neighboring Arab part of the arrondissement that lies to the east, North Africans who were being squeezed out, it seemed, by sub-Saharan Africans moving in. There was less talking and fraternizing then. In the park across the street, I observed clans of Arab mothers in djellabas talking and laughing together loudly while similar clans of French mothers whispered amongst themselves from the other side of the sandbox. Meanwhile, their children gleefully played together, not yet aware that kind of thing just wasn’t done. 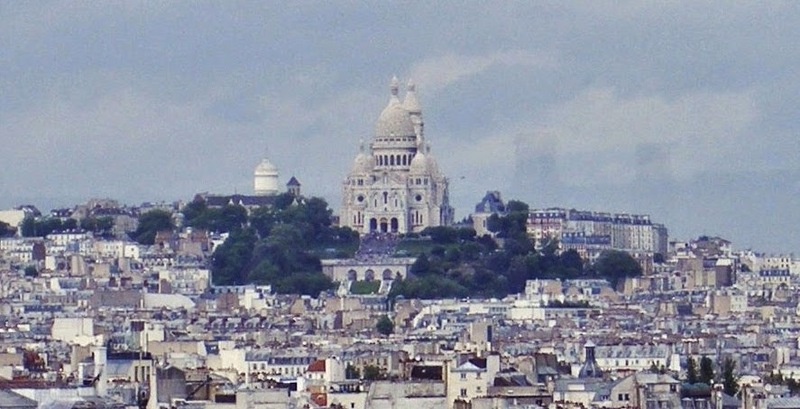 And then the Beautiful People discovered Montmartre. It was shortly after the turn of the century, post-Y2K. They had bought up and gentrified the Marais and then the Bastille areas and were hungry for a new make-over project to spend Daddy’s money on. And my Butte, my lovely hill, was looking good. They snapped up apartment after apartment - preferably in the western sector farther from the unsuitable smell of couscous and sound of Oum Kalthoum wafting from open windows. They combined two apartments - vertically or horizontally, it didn’t matter - to have more space. The result was that the population was cut drastically with the declining number of apartments and the declining number of children per family. And I noticed a huge difference on week-ends. Instead of children running around the streets and parks, the Beautiful People - the Bobos (bourgeois bohemians) - threw the kid(s) in the family car and drove to their country house for the week-end. Everything became remarkably different. Stores changed, too. If I walk down a street I can tell you what used to be in that clothes store or restaurant or bank or real estate agency - because that’s about all there is now, if you exclude a few specialty shops and a handful of hold-overs. For instance, the south side of the Place des Abbesses used to have a Tunisian green grocer, which is now a bank. A few doors down was a photographer, who closed over the summer of 2013. The mainstay of the neighborhood, directly across from the Abbesses Métro stop and next to Eglise St. Jean, was a bookstore that also sold any newspaper or magazine you might want in a number of languages, as well as a vast range of office supplies, plus fax and photocopy services. It was run by a crusty grump in a wheelchair (who was always nice to me, but then again, I smile a lot). One day he had a fatal heart attack. His children inherited the store - which he actually owned instead of just leasing. The daughter lived in Canada and the son in northern France. The son ended up running it for a year but it ate into his family time too much. I suppose he could have arranged for the staff to run it - Lord knows they’d been around long enough - but I suspect Kushmi Teas, a high-end tea retailer, made him an offer he just couldn’t resist. And so there was no longer a place to get your paper in the morning or your TV Guide at night. Finally the city of Paris set up a newsstand on the Place des Abbesses because the demand was so vociferous... and there was money to be made from residents and tourists alike. 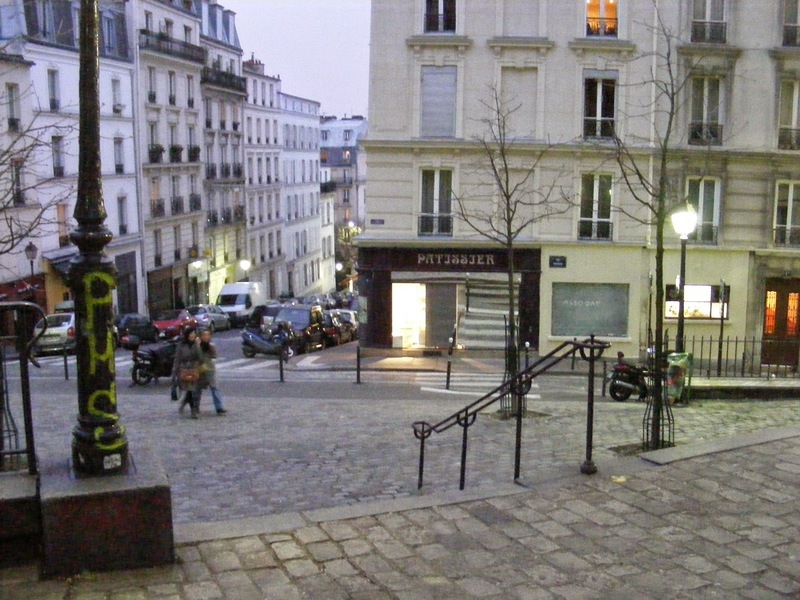 Another example is the Rue Tardieu, along the tourist route to the Sacré-Coeur. If I start from one end, the bakery on the corner is now a pizza-and-crêpe café and the florist has become just one in a long line of tchotchke shops (which are rife in this part of Montmartre). The former wine shop across from them, which I knew under two successive owners, watching their children grow up, is now a pizza parlor. Next to it, the old butcher shop is another pizza parlor. (If truth be told, the wine shop owner sold to a pizza guy just to get even with the pizza guy next door who had made his life miserable... or so he said.) Next to that was a fur store (they made the coats themselves - maybe they were Armenian refugees), which became a toy store and is now a second tchotchke shop. The former health food store now sells chocolates and macaroons and other sugary treats that are a far cry from health foods. Across from it was a little yarn shop that now sells nothing but... balls... all sizes and colors of balls: ball-shaped lights, party decorations, foam balls you’re supposed to put in a fishbowl to look pretty... you get the picture. (I have yet to see a customer in there but it’s still open after several years so maybe it launders drug money on the side.) The little eatery that had formerly been a girdle maker is now a souvenir shop, as is the children’s clothing shop run by the sister of the yarn shop lady and her husband (are you still with me?) Even the pharmacy has been transformed into a souvenir shop - a pharmacy closing is unheard of in France! So now there are five souvenir shops in a row, a whole block of them, right down to the corner, nothing but that, and all selling the exact same kitschy things! Across from the funiculaire there used to be two pastry shops. The one that belonged to the Prandys is now an up-scale perfume shop, like the almost identical one up the street. Mme. Prandy was like a grandmother to my newly-born daughter and would sing her songs in her native Alsatian accent. The other pastry shop was bought, via a straw man, by Häagen-Dazs for below its market value - something for which I’ll never forgive them. Mr. Bertheau was kind-hearted and wanted to help the young man get started in the business, at the expense of his own retirement funds (he himself had worked since the age of 14) but the straw man never even opened up for business. He just handed the keys over to Häagen-Dazs and pocketed the fee. Both the Prandys and the Bertheaus had become personal friends of mine over the years, mainly because of my two children and their love for pains au chocolat and croissants, as well as my own. On the side street, the fish monger is gone, as is the baker and the butcher, and the hairdresser/barber where old Mr. Mercier used to get a shave every morning on his walk around the city block, a way of keeping in shape for an old gentleman who won a Bronze Medal at the Olympics back in 1900. His last stop on his walk was the larger of the two pastry shops, where he once sang “Ainsi font font font les petites marionettes” for my infant daughter, complete with all the hand movements, much to the surprise of Mme. Prandy who had always found him a bit... brusque. The latest victim, which I discovered on my recent arrival, is the electrician. My electrician. A husband-and-wife team who, I’m told, have retired. They did all the work on my apartment, all the repairs, all the improvements, and sold me bulbs for all the lights that were continually blowing, a fact that became a joke between us (“You again?!”). Being close by, it was handy... and we became friendly. I always stopped in when I walked by, said hello, pet their son’s dog, which they babysat during the day, and exchanged neighborhood news. There are a few businesses that have weathered the storm. My pet green grocer is still there, albeit with a lovely remodeling of his tiny shop (see blog, Sept 22, 2013). The bookshop on Rue Tardieu is still a bookshop, but without my beloved Mlle. Pigeon, who has surely shuffled off her mortal coil by now. There’s a tiny shop that sells magazines, newspapers and office supplies on a side street, but the owners are past their retirement age, so who knows how much longer it will last. Pépone is still there for your seafood-and-fish delight, with the same little Italian lady, now white-haired, behind the cash register, who always wishes me a buon giorno or buona sera. I can still buy specialty foods from the Auvergne region in the little shop on Rue Lepic from the same sweet lady. The deli is still a deli, under new management, but their rotisserie guy just doesn’t have Monsieur Durand’s knack with poultry; the fines herbes are missing. 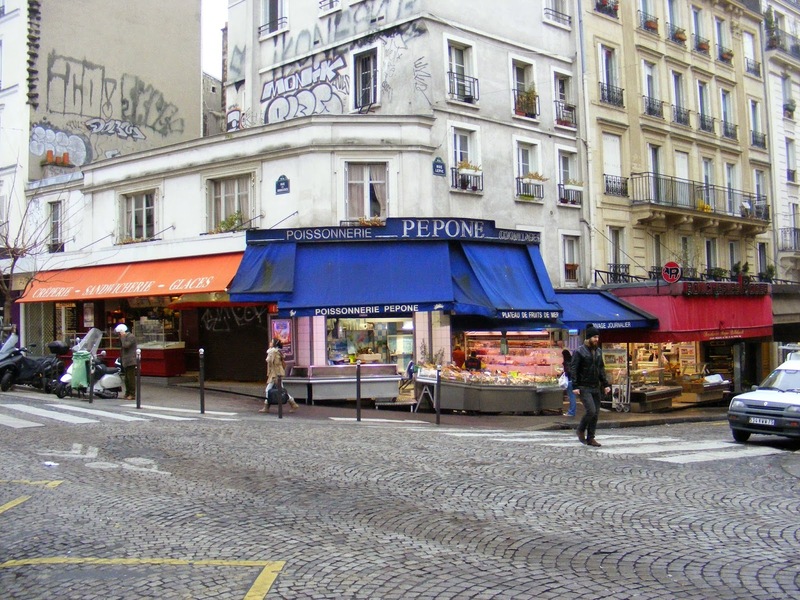 So for roasted birds and all my meat needs, I go to Jacky down the street, who is still going strong, especially as he’s now the only butcher on the entire length of the Rue des Abbesses (see blog, Feb. 15, 2014). The new baker, Gilles, across the square still bakes, but he makes only pastry, no bread, unlike Christophe (see blog, Sept. 14, 2012). Luckily, the Caves des Abbesses is doing fine, and with the owner’s son Manu at the helm it will surely live long and prosper (see blog, Feb. 22 2013). So that’s my neighborhood. 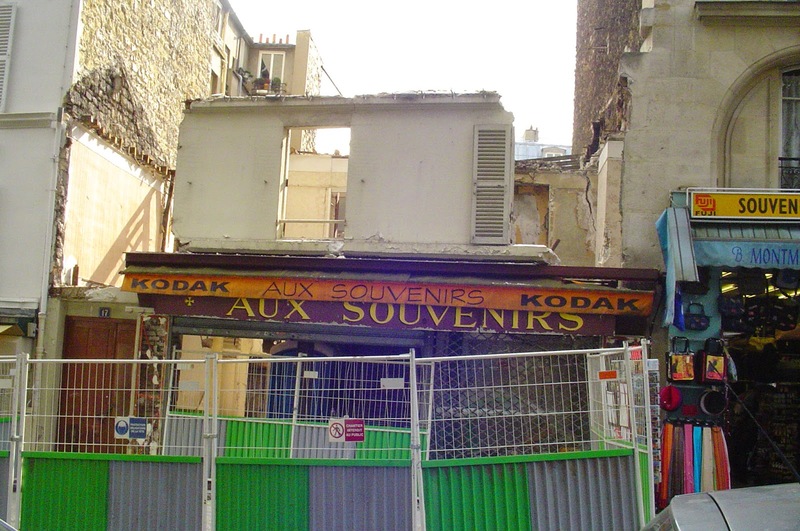 It’s changing, but the memories - or as they say in French les souvenirs - are still there. P.S. One change that I do appreciate is Pedestrian Sunday. 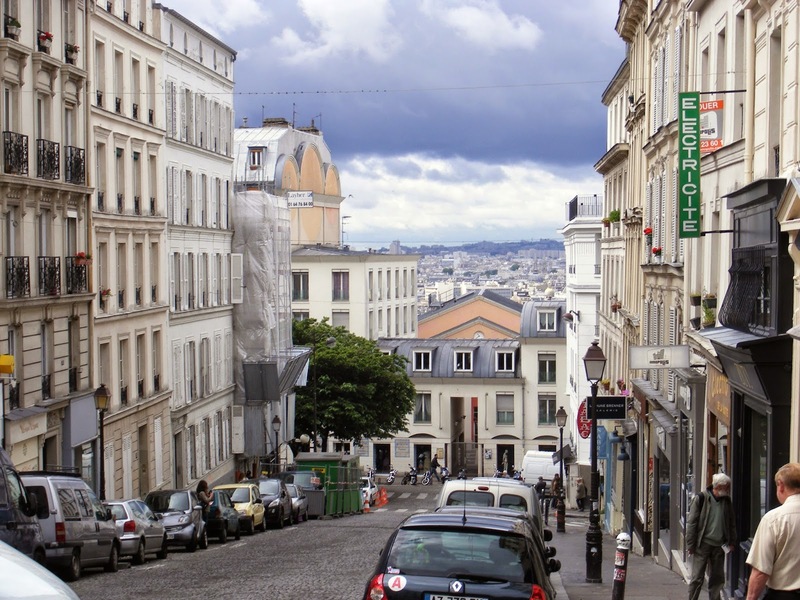 All the streets of Montmartre (from the various boulevards that encircle it right up to the tippy-top) are closed to car traffic (except the trusty little Monmartrobus) every Sunday from 11 am to 6 pm in the winter and 7 pm in the summer. If you live in that perimeter and want to drive or take a cab, you have to prove it to the cop by showing a special pass or something official with your address on it. Otherwise, it’s only people strolling, biking, skating or skate-boarding. Smiling and laughing. And the air is so much cleaner!